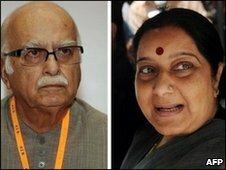 Indian opposition leader LK Advani has stepped down and announced that his replacement is Sushma Swaraj. Ms Swaraj becomes the first female politician to be appointed as the leader of the opposition in parliament. She is seen as a moderate in a socially conservative party that lost heavily in general elections in May. The BBC's Jyotsna Singh in Delhi says that she is a vociferous former information minister who will strive to give the party a younger image. Our correspondent says that her main task will be to revive the party's fortunes after recent poll setbacks. Mr Advani, who served as BJP deputy prime minister for two years from 2002, will now hold the largely ceremonial post of parliamentary chairman, the party announced. "This is a new chapter in my life," he said. The BJP ran India from 1998 until 2004, when the Congress party defeated it in national elections. Correspondents say that Mr Advani will be remembered for being politically moderate while in power, in contrast to his role in the 1990s, when as a firebrand opposition leader he was prominent in urging Hindus to tear down a mosque in the northern town of Ayodhya which he said was occupying the site of a Hindu temple. In another leadership change, Nitin Gadkari has been named as new party president to replace political veteran Rajnath Singh, who has been blamed for the BJP's recent string of disasters in regional and national polls. Mr Gadkari, 52, is currently the BJP chief in the western state of Maharashtra.